The invitation from Yelp read: ‘a tutored tasting of one of a kind cocoa creations, chocolate bars, and chocolate cocktails from the chocolateria menu at Artisan du Chocolat’ and I felt like little Charlie Bucket when he peeled back the wrapper of his hard-earned Wonka bar and first caught the glint of his Golden Ticket. 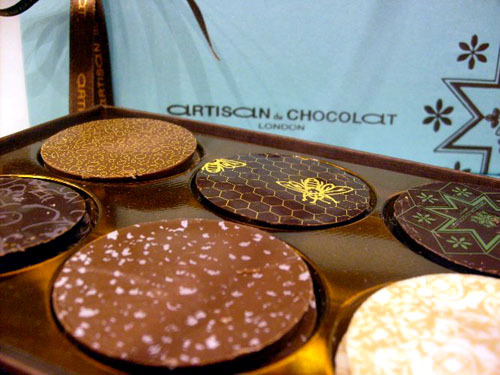 I’d never say no to a chocolate tasting in the first place, but a private behind-the-scenes showcase of the couture creations from one of London’s most illustrious chocolatiers? My eyes grew bigger than Everlasting Gobstoppers. My excitement only continued rising upon stepping into the shop in Bayswater, a curious composition of luxury boutique crossed with gleaming white and futurisitic space pod. 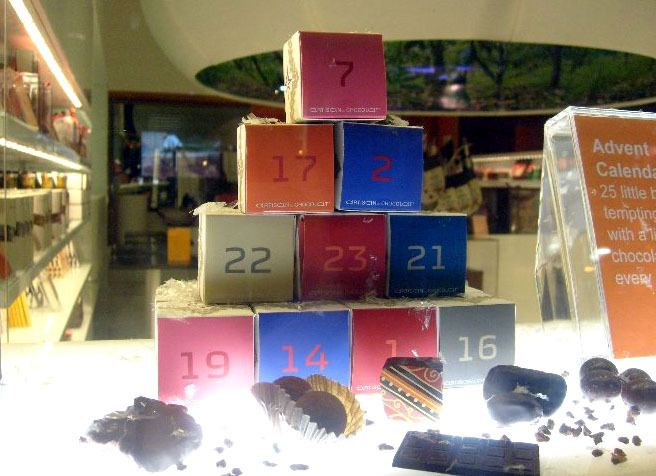 Squares of etched chocolate as colorful as works of modern art, rounded truffles piled like jewels on a queen’s dressing table, boxes of caramels as classic and streamlined as the most expensive French perfume. My mouth dropped open, and stayed open for the next two hours as we lucky Yelp Elites were plied with chocolate, caramels and cocoa in an stunning array of forms and flavors. Elise, our knowledgable and well-spoken Willy Wonka leader (much less insane) presented our group with a nearly comprehensive tasting of Artisan du Chocolat’s offerings, starting with a smooth and tongue-coatingly rich malted hot chocolate. As we then sipped a fizzy and bright Cocoa Pod and Prosecco Bellini, Elise began walking us through the chocolate-making process from the harvest of the cocoa pods from equatorial tropical rainforests through fermentation, drying, cleaning, roasting, and removing of the shell to get 100% cocoa nibs. 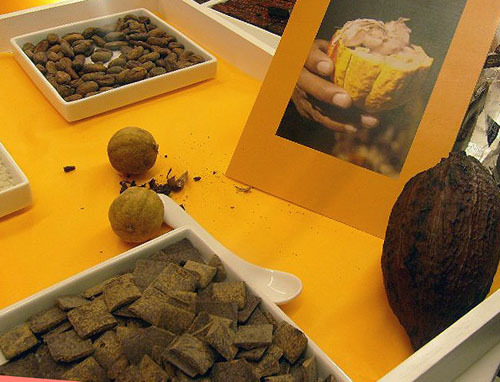 A photo of a raw cocoa pod, a dried version, bits of pure cocoa mass, and two sundried limes for flavor. These nibs are then processed into chocolate liquor and then further processed to remove the cocoa butter. 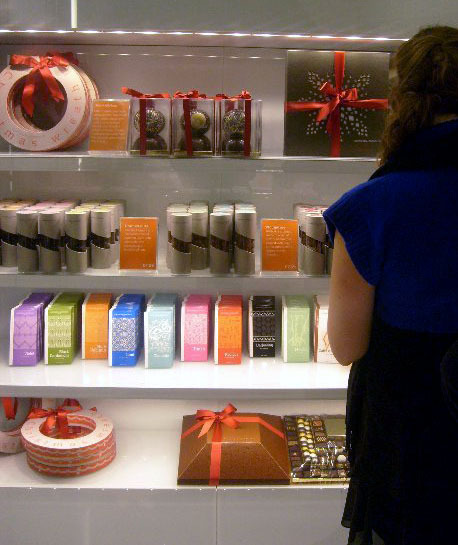 The best producers add cocoa butter back in order to keep the chocolate solid at room temperature, but it’s often replaced by less expensive vegetable oils in crap industrial chocolate because the fatty cocoa butter can be sold at high cost to the cosmetics industry. This is why, unsurprisingly, eating cocoa butter bits tastes like a mouthful of moisturizing lotion. You would think this is not something I would need to test out for myself, but you’d be wrong. 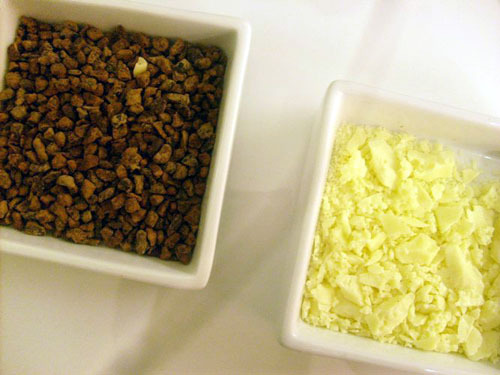 Cocoa nibs on the left and cocoa butter on the right. Not delicious, as I will warn you from personal experience. 1. Pure cocoa liquor from Bali. Looks and tastes like dirt. 2. 100% chocolate from Bali. No sugar but ‘conched’ to get a more familiar silky texture. However, still like sucking on a piece of bitter chalk. 3. Dark chocolate (72% cocoa) from Bali. This is when the sugar starts entering the picture. Mmm. Now we’re getting somewhere. 4. Dark chocolate (72% cocoa) from Java. Just like wine and coffee, chocolate flavors are affected by the terroir, or the environment in which the original and unaltered product (grapes, coffee plants, cocoa pods, etc) is grown. Smoky with the barest hint of bananas. 5. Dark chocolate (72% cocoa) from Jamaica. This chocolate had a subtle spice and an almost savory element, like a whiff of meatiness or mushroom. Umami, perhaps? 6. Milk chocolate (40 % cocoa) from Jamaica. Smooth and familiar, lots of spice notes. 7. Almond milk chocolate (40% cocoa). Nutty and light. 8. Milk chocolate (40% cocoa) infused with Tonka, a spice from Venezuela. Layers of vanilla, almond, warmth. 9. Milk chocolate (40% cocoa) infused with Lumi, sundried limes. Subtly citrusy, reminiscent of a Moroccan feast. 10. Matcha White chocolate. This green tea flavored bar, like all white chocolate, contained no cocoa, just a mix of cocoa butter, milk powders and sugar. A bit sugary for my taste, but still that soothing green tea essence of one of my favorite ice cream flavors. 11. Gingerbread Spice White Chocolate. Christmas in your mouth. This is when things started to go crazy, like we had stumbled into the Inventing Room of the Wonka Factory. As inventive as Scarlet Scorchdroppers and Galumptious Gobstoppers, but classy and artistic in both taste and presentation. 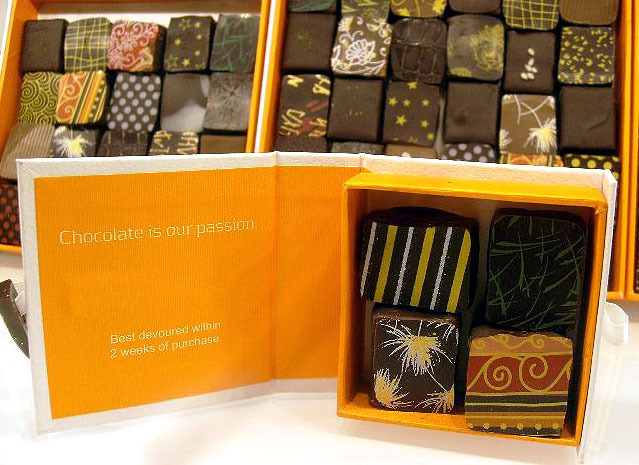 A mosaic of gorgeous chocolates in an adorable little box. 12. Chocolate Ganache with Fresh Mint Leaves. It’s a mojito in my chocolate! (You can tell the sugar high is starting to kick in). 13. Chocolate Ganache with Tobacco Leaves(!) This insane little bite of nicotine was designed for Michelin-starred molecular gastronomist I-cooked-a-whole-pig-sous-vide-in-a-hot-tub crazyface chef Heston Blumenthal to serve at the Fat Duck. After swallowing, you can actually feel the slight burn at the back of your throat like you just took a drag of a cigarette. 14. Feuillantine. An elevated version of the Ferrero Rocher, all hazelnut and crunchy wafer with a bit of gingerbread spice. Salted caramel is everywhere now ( I miss you, Bi-Rite Icecream) but Artisan du Chocolat claims to have developed it first back in 2002 for Gordon Ramsay at Claridge’s to a slew of accolades and copycats. 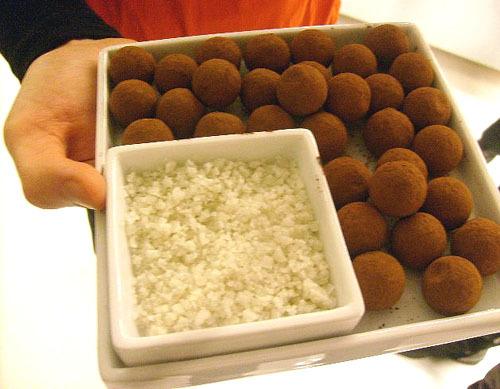 Whether or not it’s true, these spherical dark chocolate shells bursting with liquid caramel and unrefined grey sea salt are sublimely, ethereally, orgasmically perfect little bites of heaven. Pop the whole ball in your mouth and crunch into it, allowing the indescribable mix of sweet and salt spill out over your tongue until you quiver with delight. I would like to purchase this liquid by the gallon and bathe in it. Dangerously enough, it is sold in liquid form. 15. 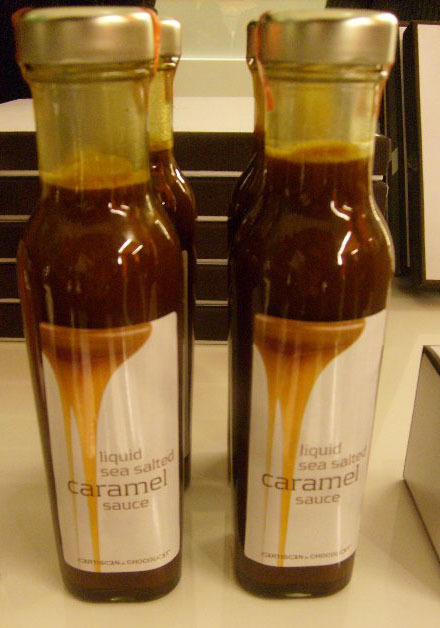 The original Sea Salted Caramel. Amazing. 16. Salted Caramel with Lemongrass. Lovely and aromatic. 17. 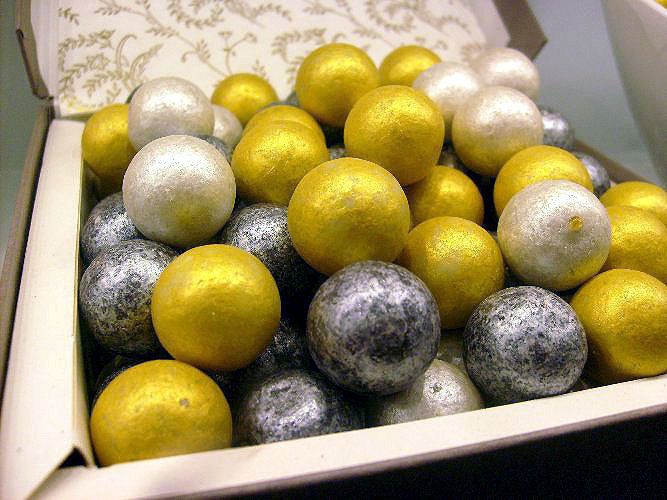 Sparkling Wine Truffle. Champagne truffle is the more usual phrase, but this one features a British sparkline wine from Kent instead called Chapeldown Brut. Instead of the horrid shock of liquor you get from cheap alcoholic chocolates, this truffle effortlessly rides the edge between dessert and cocktail. Seventeen chocolates? That should have been that. Except our friend Sarah was curious about the banana flavored chocolate and we walked over to ask Elise: What’s the banana chocolate like? Is it…really intensely banana-y? Barely was the question out of her mouth when Elise marched us over to the display and handed one each to Sarah, Chris and me. 18. Banana Chocolate. Nope. Not too banana-y. In fact, just right. But it didn’t stop there. 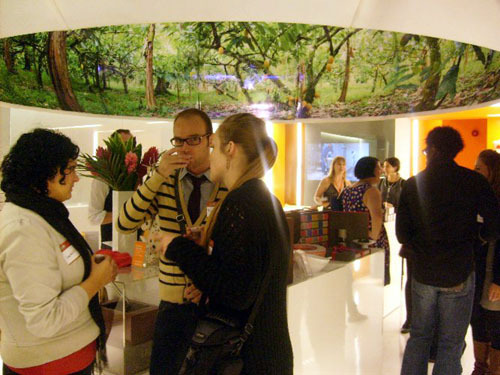 Standing as we were in front of the bowls of imaginative new salted caramels, Elise reached over and doled out more. 19. Salted Caramel with Balsamic Vinegar. Oh. 20. Salted Caramel with Sage and Thyme. My. 21. Salted Caramel with Pink and Black Peppercorns. God. ….<stunned silence>…..This might just be the best thing I’ve ever put in my mouth. I managed to collect myself enough to purchase a box of salted caramel with peppercorns and then spent the rest of the time wandering around the shop in a sugar-induced haze. I may not have been able to put anything else in my stomach, but the shop was also a feast for the eyes, a tastefully curated museum of confection. 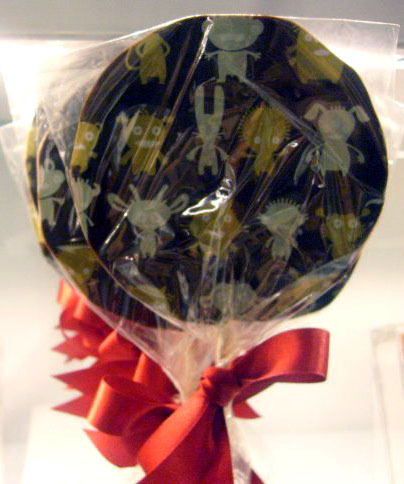 I loved the silver, gold, and pearlescent chocolate balls, but was even more entertained by the ‘Monster-Covered Lolli’ below, placed directly at eye level for someone of smallish stature who might be entranced by this particular combination of candy and cartoon. There’s no good way to photograph something wrapped in plastic. It was virtually impossible to leave without handing over all the money in my wallet. They’re for Christmas presents! Really. I swear. But alas, we had to finally say goodbye. And then promptly turned around and peeked back in the window. If only the Golden Ticket Charlie Bucket experience analogy continued to Mr. Wonka appearing and handing over the keys to Artisan du Chocolat: I want you to be my heir and run the factory, Mei. It’s all yours! What’s the likelihood of you eating the ‘presents’ before you get a chance to hand them over? @jonny um…did i say i bought presents there? i have no idea what you’re talking about. everyone i know is getting socks for christmas. MUAHAHAHAHA. Craaazy! I’ve been watching Heston Blumenthal on BBC lately and I can totally imagine him explaining the conception of a tobacco-flavored chocolate treat. See you in two weeks, big sis!